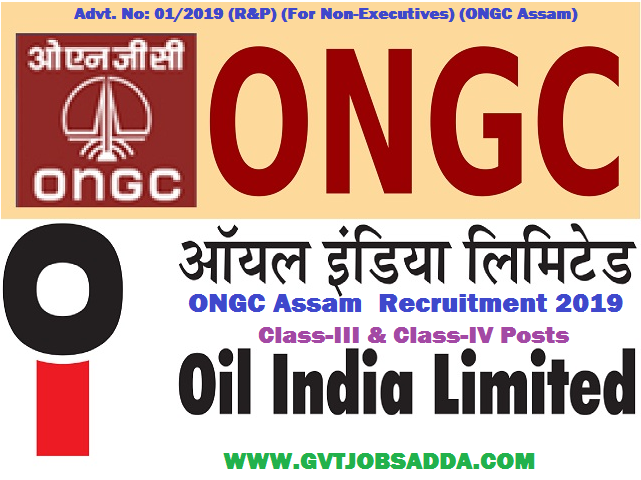 Oil and Natural Gas Corporation Limited (ONGC) Has Recently Published Recruitment Notification for The Class-III & Class-IV Posts In Assam. Those candidates who are interested & eligible for ONGC Assam Recruitment 2019 Candidates should visit website and read Advertisement Notification Carefully & apply online before last date of apply. Brief Information about ONGC Assam Recruitment 2019 Given Below. Age Limit: Check official notification to know this posts age limit. Educational Qualification: 3 years Diploma in Mechanical Engg with First Class Boiler Attendant Certificate. Educational Qualification: Graduate with proficiency in typing speed at 30 wpm and shorthand at 80 wpm. Certificate/ Diploma of Computer Applications of minimum 6 months duration. Educational Qualification: High School or Class X Equivalent with Science and trade certificate in Electrician trade. Should have valid certificate of competency as Electrical Supervisor. Educational Qualification: BSc with Physics or Maths as one subject with typing speed at 30 wpm with Certificate/ Diploma of Computer Applications of minimum 6 months duration. Age Limit: Candidates age should be between 18 years to 30 years as on 27.01.2019. Age relaxation is 3 years for OBC & 5 years for SC/ST. Educational Qualification: 3 years Diploma in Electrical Engg. Should have valid certificate of competency as Electrical Supervisor. Educational Qualification: 3 years Diploma in Electronics/ Telecom/ E&T Engg. OR MSc in Physics with Electronics. Educational Qualification: 3 years Diploma in Instrumentation Engg. Educational Qualification: 3 years Diploma in Auto/ Mechanical Engg./ Post Graduate Diploma in Business Management/ Administration or any post graduate. Valid Heavy Vehicle Driving License is essential. Educational Qualification: Graduate Degree with one year relevant experience in security. Educational Qualification: Bachelor Degree in Optometry. Educational Qualification: High School or Class X Equivalent with Science and trade certificate in Fitting or Mechanic trades. Educational Qualification: High School or Class X Equivalent with Science and trade certificate in Auto/ Fitting or Mechanic trades. Valid Heavy Vehicle Driving License is essential. Educational Qualification: High School or Class X Equivalent with Science and trade certificate in Diesel trade. Educational Qualification: High School or Class X Equivalent with Valid Heavy Vehicle Driving License and 3 years driving experience of heavy vehicles. Educational Qualification: High School or Class X Equivalent with Valid Heavy Vehicle Driving License and 3 years driving experience in loading and unloading. Educational Qualification: BCom with typing speed at 30 wpm and Certificate/ Diploma of Computer Applications of minimum 6 months duration. Educational Qualification: Graduate with typing speed at 30 wpm and Certificate/ Diploma of Computer Applications of minimum 6 months duration. Educational Qualification: Graduate in Hindi with English as one subject. Typing speed at 30 wpm in Hindi to be conducted on Computer and Certificate/ Diploma of Computer Applications of minimum 6 months duration. Educational Qualification: Intermediate with 6 months training/ experience in security. Educational Qualification: Intermediate with 6 months experience in fire services. Valid Heavy Vehicle Driving License. Educational Qualification: Diploma / Certificate of minimum one year duration in Industrial Hygiene. Minimum 01 year inline experience. Educational Qualification: Diploma in Pharmacy of minimum 2 years duration. Educational Qualification: Diploma / Certificate of minimum one year duration in Medical Lab Technology. Minimum 01 year inline experience. Educational Qualification: Diploma / Certificate of minimum one year duration in Sterilization-CSSD. Minimum 01 year inline experience. Educational Qualification: Diploma / Certificate of minimum one year duration in Radiography or Medical Radio and Imaging Technology. Minimum 01 year inline experience. Educational Qualification: Diploma / Certificate of minimum one year duration in Anesthesia Technician. Minimum 01 year inline experience. Educational Qualification: Diploma / Certificate of minimum one year duration in ECG. Minimum 01 year inline experience. Educational Qualification: Diploma / Certificate of minimum one year duration in Operation Theater Technology. Minimum 01 year inline experience. Educational Qualification: Diploma / Certificate of minimum one year duration in Dental Hygiene or Dental Assistant. Minimum 01 year inline experience. Age Limit: Candidates age should be between 18 years to 27 years as on 27.01.2019. Age relaxation is 3 years for OBC & 5 years for SC/ST. Educational Qualification: High School or Class X equivalent with First Aid Certificate. The selection of the candidates shall be done through a Computer Based Test (CBT) followed by PST/PET/Skill tests wherever applicable. The candidates have to qualify at each stage separately. Eligible candidates would be required to apply on-line ONLY through the link available on ONGC Website: www.ongcindia.com from 07.01.2019 to 27.01.2019 till 1800 hrs. No other mode of application shall be accepted.